Every individual craves to translate their living space, especially their master bedroom into a personal retreat for them. Your house cannot reveal your personality as there are many people residing in a home. Only your bedroom can well describe your taste, likings and overall personality. Everything about the room such as walls, flooring, décor, furniture, and overall ambience; all these elements will define about what kind of person you are. The environment of your room gives you new vibration and if it’s good and matches your personality, it will give you energy boost every morning you wake up. Colors of the room should match your age, basic nature and likability. For example you can define a kid’s room with all vivacious hues like greens and blues and yellows. For a newly married couple, the ambience has to be more romantic and you will prefer colors such as reds and pinks, etc. This is how colors are selected from the spectrum considering the age and likability. 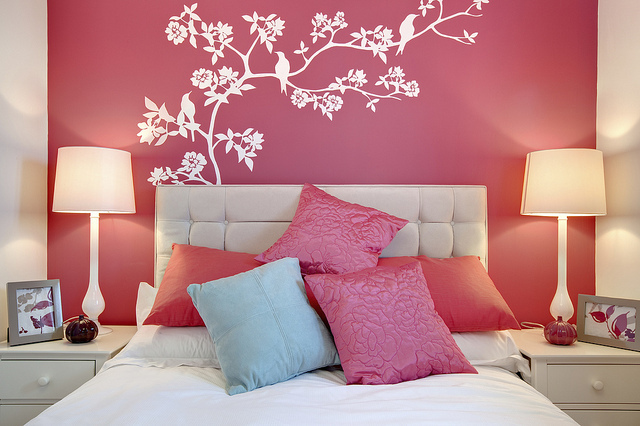 Choosing color of your room is a demanding task. You have to scroll through many colors, make perfect combinations, etc. It is the first task in embellishing your personal space. Master bedrooms are larger than any other bedroom in the house. The significance automatically increases and therefore, you need to work more in the course to decorate it adeptly. First and foremost, occupant’s age is a must to be considered. Suppose you are in your middle 50s, you might like colors that soothe your soul and mind every moment you spend in the room. Pastels are the shades for you as they have the tendency to create peace around in the room. Among the pastels, you can pick any color that you like. A newlywed couple should look for a romantic blend in the room so as to maintain the passion. Rich reds in combination with browns can create a romantic aura of the room. If you feel apprehensive of adding multiple colors in your room, you can always brighten the wall just behind your bed and keep other walls neutral. Choosing colors for adults would be the most perplexing task. Their choices are very different and unique. It is never recommended to color the walls with single shade. To describe their unique likability, you can always use wallpapers or other designs and patterns on the wall along-with. As youngsters need frequent revamping of the room, you can always get the already installed wallpaper eradicated and replace it with something new and trendy. Blues are most soothing colors for every room. They give you peace of mind and you will always feel refreshed while entering your living space. Blue is more of men’s shade. They are so coveted with this color that they don’t feel the need to replace blues with any other color in the world. Well, for a masculine room, you can always opt for various shades of Blue. Girls are more into love and merriment themes. Colors like purple, pink, hot red, etc. are more of a girly thing. These colors finely depict the personality of a girl and make her living space look as lovely as she is. So, these were some of the tips and facts that can help you in assimilating colors that can give a youthful and refreshing touch to your room. As I said, paints are the first thing to begin with the décor of your room and every other thing depends on the color of the walls, you need to be extra careful with this. Components to add Oomph Factor in Your Boy’s Bedroom Teen’s Bedroom Design Cheatsheet: Grab An Option Delectable Decoration Concepts For a Girly Bedroom Bedroom Design Ideas: Holding On To The Trends Reason to change mattress When do You Need A New Mattress?